Hands Across the World is a Perth based charity who’s mission is to tackle the atrocities of human trafficking, sexual exploitation, and human slave labour through education programs. We believe education is the great equaliser, and the key to preventing such attrocities by empowering people to create a brighter future for their whole community. Our main focus in achieving this is teacher training. Our Interactive Teacher Training Program in Siem Reap is for dedicated and determined teachers In Cambodia who cannot afford any further studies due to the remoteness of their village, poverty and/or marginalisation. Our main fundraiser for this project is our Paint for Hope art class. 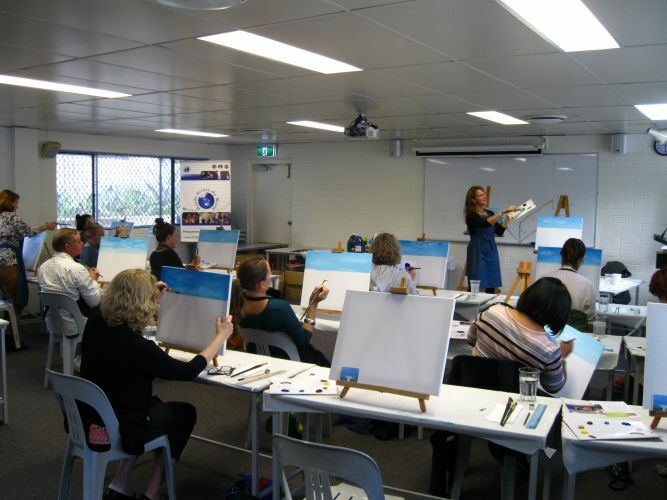 This is a great way to spend a Sunday afternoon, whether you want to learn to paint, or you’re already an experienced painter and want to brush up on your skills. Create your own masterpiece and at the same time, help create a brighter future for those less fortunate. The project is in cooperation with Perth professional artist, Gabriela Himstedt (http://www.colouryour.life/). The class is suitable for everyone whether you’re an absolute beginner and haven’t painted since school, an experienced artist wanting to improve your knowledge of art, or just want to try something new. Gabriela will guide you through the process step by step while you add your own personal touch for the final result. A feature painting will be chosen for the class, with Gabriela painting alongside the class to offer guidance. Learn how to mix colours and different painting techniques to create a masterpiece to take home. Time: 2pm – 5pm (including breaks), three hours session. Cost: $58 (all materials provided). Light afternoon tea with biscuits and tea included. All proceeds from this workshop goes directly to the Interactive Teacher Training project of Hands Across the World. Come make this world brighter!